An era has finally come to an end in Green Bay. Randall Cobb has been one of Aaron Rodgers' favorite targets at Lambeau Field ever since being drafted by the Packers out of Kentucky in 2011. However, Cobb entered the offseason as a free agent and has now signed with the Cowboys, meaning 2019 will be his first year in a jersey other than Green Bay's for the first time in his pro career. 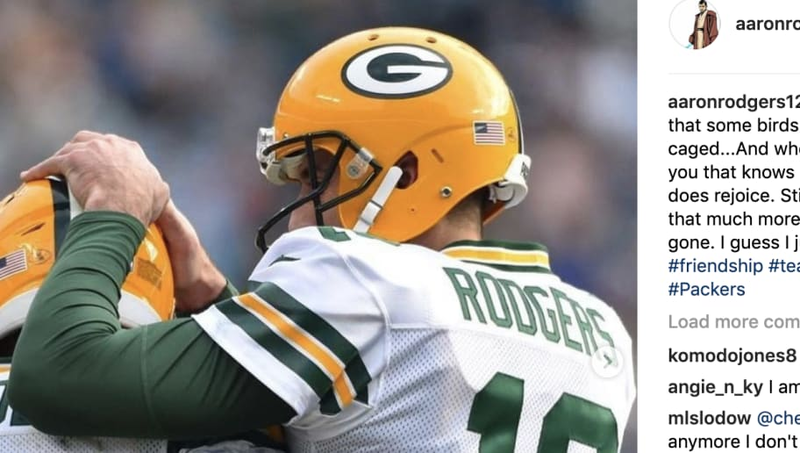 Now, Rodgers has taken to Instagram to share a heartfelt message in regards to his departing teammate, a consistent, reliable target the quarterback will sorely miss on the field next year. It's incredible just how much the Packers franchise has changed recently. Jordy Nelson, Mike McCarthy, Clay Matthews, and now Cobb are all gone. Green Bay is entering truly uncharted waters, with an air of unfamiliarity surrounding nearly every position within the franchise -- including at head coach -- and it will be up to Rodgers to dictate how the team carries itself into this new era. Green Bay needed to shake things up, especially after going 6-9-1 last year and missing the playoffs for the second straight year. However, unless Rodgers has some trademark magic in him for 2019, we could be witnessing the very demise of the Packers' NFC rel right before our eyes. Regardless, the team on the field in Green Bay won't look quite the same next year without Cobb, and while Packers fans are sure to miss the reliable wideout, no one is going to miss him more than his now-former quarterback.